There were two conversations at the launch event on this topic; a Working Group is yet to be formed. Please contact David Midgley at info@zerocarbonyorkshire.org if you are interested in helping to start this group. The UK only has 2% coverage of ancient woodland, only half of the cover we had as a nation at the end of the Second World War. Only 15% of this is currently protected. Ancient woodland provides huge ecosystem services and benefits and is a very important Carbon sink. 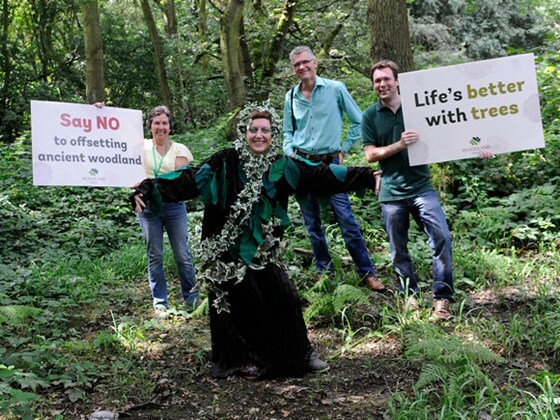 ~ There is a potential potential problem of cutting down ancient woodland to replant more somewhere else under the proposals of “Biodiversity Offsetting.” This is a process that aims to replicate thousands of years of natural colonisation by species in a matter of a few weeks. ~ Zero Carbon Yorkshire need to be against this process and campaign against the development of sites such as Smithy Wood in Sheffield at junction 35 on the M1. ~ Contact needs to be made with the Forestry and Woodland Advisory Committee to seek their support for the petition who meet in York and that of the Ancient Tree forum. ~ Sponsorship needs to be obtained in order to allow the petition to go ahead. ~ Potential tree planting sites have been mapped, proposing a ‘Forest of Leeds’ in the Upper Aire catchment, and a ‘Forest of York’ in the upper Swale catchment. ~ This is an initiative that should ideally be considered across the North – as part of the Great North Plan. ~ The benefits of afforestation are much wider than a simple carbon sink, in publicising the benefits to the economy directly and indirectly it will appeal to a much wider range of people and businesses.